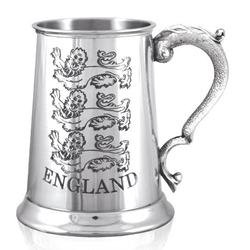 Our England Three Lion One Pint Pewter Tankard measures 5.11 inches tall by 3.14 inches wide. Display your proud patriotism with this handsome three lions England one pint tankard. We have a long and proud history of producing the highest quality pewter ware and this tankard is no different. The straight sided body of the tankard is decorated with a three lions logo and the text 'England' underneath, making it equally ideal for a proud Englishman or a big football fan. The tankard also features a curved, Georgian style handle to really complete the stylish look of this tankard. To make the tankard truly individual, your professional and highly skilled engravers can add a name, date or message of your choice which will really make the recipient's day.